During the 14th century, following the conquest of Asia Minor, the Ottoman forces expanded their military operations by crossing over to the Eastern Thracian shores of Europe, aiming to conquer the remaining territories of the Byzantine Empire. The invading forces were weakened by a shattered central administration, years of civil war, the plight of the rural population by invasions of raiding forces, and the strike of the plague epidemic with the greatest severity on urban centers. During those challenging circumstances, characteristic of the fragmentation and decline of the Empire, provincial townships and fortified strongholds had to rely on their own resources in fighting against the invading Ottoman forces, without any military aid or financial provisioning from the capital in Constantinople. 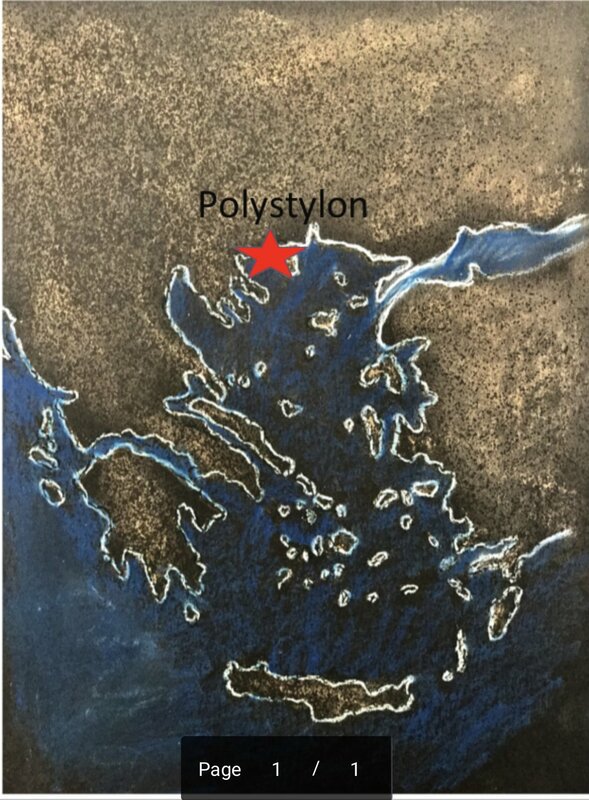 One of those strongholds, located on the Aegean shores of Western Thrace, was Polystylon Fort. It was positioned on the acropolis hill of the ancient city of Abdera, protecting behind its fortification walls both defenders and refugees fleeing the Ottoman forces who besieged it in 1357. When the fort fell in the early 1380s, one of its most valiant veteran defenders suffered a massive head trauma and a decapitation by his captors. Archaeological evidence revealed that the decapitated head alone was retrieved and buried secretly, within the grave of a child, according to Christian customs, showing that there must have been witnesses to his execution. Archaeo-anthropological and paleo pathological analyses conducted determined in addition to the perimortem head trauma and decapitation, the presence of an earlier healed head and facial trauma sustained by the veteran defender along with traces of relative surgical intervention. This poster presentation aims to explore the evidentiary data of the historical-archaeological record through the spectra of Scientific/Medical illustration in depicting the post mortem visualization of the veteran’s head trauma. · The Polystylon Fort was located on the strategically important Acropolis hill of Ancient Abdera. · The fort, which housed defenders and refugees, was besieged by Ottoman forced in the mid 1300’s. · Archaeological and anthropological data provided insight into the history of the site. · The adult males uncovered, showed signs that they were war veterans (traces of trauma). · This poster focuses on one particular veteran, who was decapitated, buried within the site of the Late Byzantine Period. · The forensic study and research of this burial ground was published by Dr. Anagnostis Agerlarakis. · The decapitated remains of the veteran not only show his story, but also reveals their society, which cared for their wounded and their dead. · This veteran’s decapitated remains were buried alongside a child burial, which archaeological evidence shows, the child was laid to rest much earlier than the decapitated veteran. · The head of this veteran was buried shortly after his death, since they were in anatomical order and not scattered. His decapitation was post mortem. · The head was buried in the eastern direction, which was symbolic of Christian burial practices. · The trauma which cause the death of this veteran was from a heavy weapon that penetrated the frontal lobe, causing immediate death. · Furthermore, the veteran had a healed mandibular fracture possibly caused by a spear head. The healing of this severe trauma required great care and medical expertise. Agelarakis, A. (2017). The fall of Polystylon Fort to the Ottomans: The Historical Context and the Narrative of its Decapitated Defender. Byzantina Symmeikta. Agelarakis, P.A. & Agelarakis, A. (2015). Abdera/Polystylon: A Byzantine Town in Western Thrace in the Context of Historical Developments during the 6th-14th Centuries as Depicted by its Archeo-Anthropological Record. Byzanteina Symmeikta, 25, 11-56. Meineck, P. & Konstan D. (2014). Combat Trauma and the Ancient Greeks. Palgrave MacMillan. In the memory of all fallen veterans and to those who made great sacrifices in protecting their loved ones. Ancient Origins Feb 2019 Article: "How Ancient Warriors Coped with the Trauma of War." 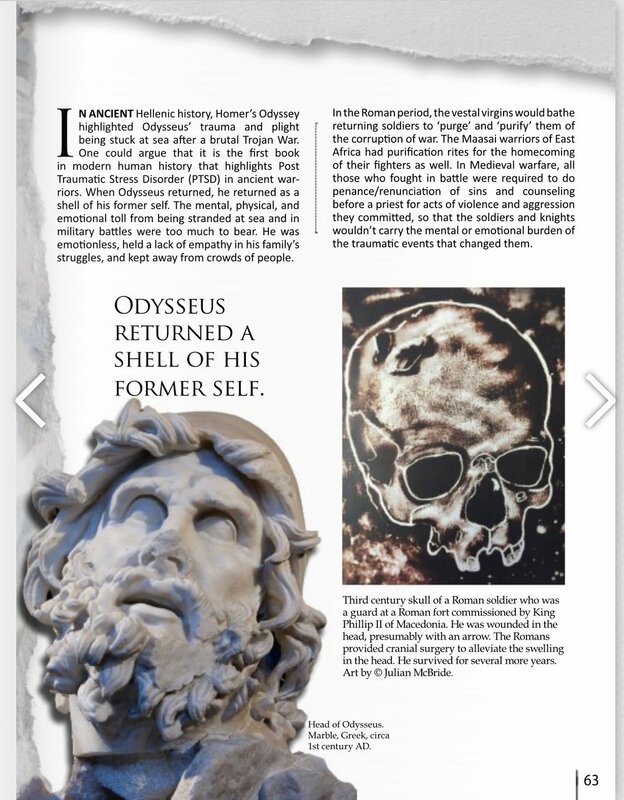 Ancient Origins magazine article featuring our director, forensic anthropologist Julian McBride on trauma and ancient warriors.